Recently, BSSCommerce has developed 3 awesome Magento 2 configurable product extensions for better display of configurable product in Magento 2. Like the great group of Magento 1 configurable product extensions, 3 modules has 3 different methods to display configurable product in the frontend for better customer experience. Let’s find out what they are. In the beginning, we will reveal the common question: What is the difference among these extensions? The most apparent difference among these extensions for Magento 2 configurable product is that the way the configurable product is displayed in the frontend. With Magento 2 Configurable Product Grid View, it shows all children items in the table, whereas, Magento 2 Configurable Product Wholesale Display gets the last attribute of the configurable item to present in the table with other attributes above that table. Meanwhile, the last extension chooses another performance: taking 2 last attributes of the configurable product and display them as matrix view, and other attributes still show above that matrix table. Now, moving to the details of each great Magento 2 Configurable Product extension. Configurable Product Grid Table View for Magento 2 displays children products of the configurable product in a neat table to allow customers to add multiple simple products to cart at once. Customers no longer have to choose each value of attributes, they just need to input quantity in the table to order. Besides, they can know what is chosen with a detailed total below the grid table. They can see which child product is discounted right in that grid table. This grid view will be inconvenient and not optimized if the configurable product has many attributes and values. The grid table will be like a long list leading to unfriendly performance for customers to purchase. Besides, compared with 2 other configurable product extensions, this module doesn’t support showing tier price of children product, which makes customers be confused about price when ordering. Additionally, admins cannot apply grid view for specific configurable products as wish, they only enable grid table view for all configurable product at one time. Another drawback of this extension is that it is not optimized on mobile. Support Advanced Tier Price: the Total amount is based on the tier price of the total quantity of children products added to cart. However, this function is only applied for children products which have the same tier prices. That means: if a configurable product has 50 children products, all 50 children products need to have the same tier price. In case, there is at least 1 children product does not have tier price or have different tier price with others, this feature will not be applied. For example, tier price of buying 1-9 Black-S shirt, 1-9 Gray-S shirt is similarly $35. Tier price of buying 10-more for every children product is $30. Therefore, when you buy 3 Black-S shirts and 7 Black-XL shirts, tier price is now $30/shirt. The total amount is now $300. If you disable this feature, the total quantity will take default tier price, which means that the total amount is calculated by tier prices of each children product multiply to total quantity of each chosen children product. For the above example, when using Magento 2 default tier price calculation, the total amount is determined as $350 because it is calculated based on each tier price of each children product (Tier price is equal to $35/shirt). At first, this extension can work with the configurable product which has many attributes. Secondly, this wholesale display module can be configured to choose which attributes to show on various devices. Besides, store owners can select the color of the header row text and background for a more attractive table. This extension is the only one integrated with Hide Price function for customer groups. Like the above extension, this module also cannot be applied for particular configurable products. Magento 2 Configurable Product Matrix View shows the configurable product in a neat matrix form for faster ordering which is suitable for wholesalers. 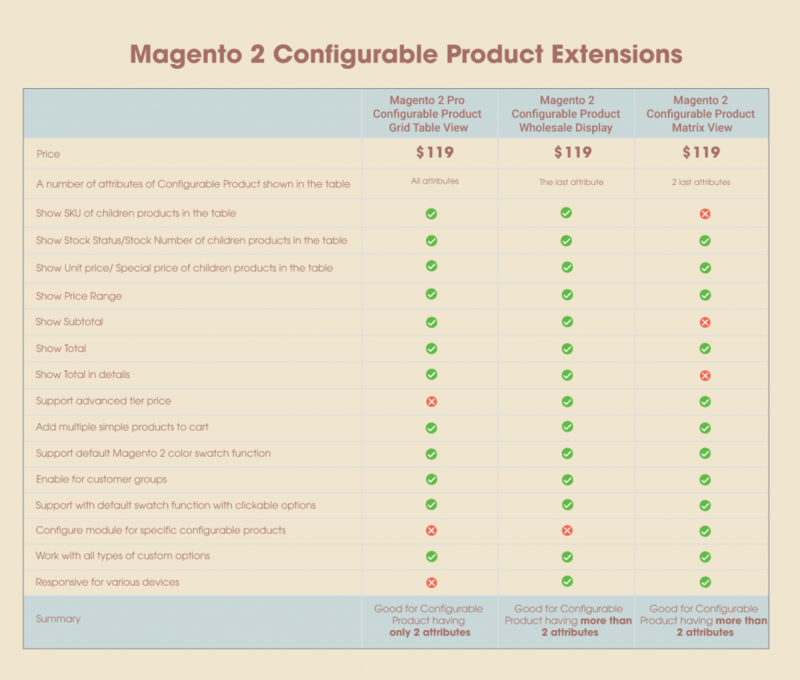 Support Advanced Tier Price like Magento 2 Configurable Product Wholesale Display extension. It works well with many attributes like Magento 2 Configurable product wholesale display extension. Unlike 2 above extensions, the admin can apply matrix view for particular configurable products. This configurable product extension doesn’t show the total in details and subtotal. Do you find this blog helpful? Please Like, Share and Subscribe to update other upcoming useful articles.